This large 16 & 3/4 inch viola for sale was made in 2005 in Beijing, CHINA for West Coast Strings. It is a quite attractive viola and is the mid-range Sandro Luciano West Coast Strings instrument. This viola has an attractively carved body made of high quality spruce and maple. The maple back has a nice tight grain and moderate flame. The varnish is a nice golden brown spirit varnish. The 16 & 3/4" Luciano Viola is completed with fancy boxwood fittings. It has a lovely tone that rings sweetly and is only moderately dark. The extra body length gives this viola extra power so that it has very nice projection. 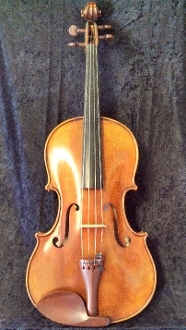 The viola is brand new and in excellent condition. Because it has an extra 1/4" in body length, priced at $2500.00, the Sandro Luciano viola is best considered by tall or long-armed violists who are looking for a larger instrument to get some extra "oomph".